By adding advisors to students, you give those people detailed access to the students' course, academic, and discipline information. By setting up flag thresholds, you establish a warning system for students at risk of failing, missing too many classes, or performing poorly in their courses. As course faculty take attendance, enter grades, and finalize courses, they supply the information needed for advisors to monitor their students' performance. Additionally, course faculty can manually-flag students to call an advisor's attention to a troubled student. Troubled students may be given a disciplinary status or have certain locks placed on their account. You can read about some of the above-mentioned tasks on the Student Profile, in Courses, and in Advising Setup. The Advised Students report draws all these threads together and is a handy starting-point for advising tasks. Academic Admins and Registrars can see any student, whether or not a student has an advisor. If the user is also an advisor to any students, the report will initially show only the advised students; to see all students in this case, just remove the Advisor is ___ filter. Advisors can see only their advised students. Academic Admins and Registrars can manage advisors, registration locks, email students, and export the report. Advisors cannot manage advisors, but can perform all other actions (see below). Check if you wish to include inactive students in the report. Check next to Sara's name to perform various actions for her (and not the other students shown in the report at the time). You'll see the student's most serious flag in this report; these flags may have been triggered by flag thresholds or were manually-added on the student course summary. Read more about flags here. Click Sara's name to go to her advising view, where you can view her transcript, link to individual course summaries, and manage her academic flags. You'll also see Sara's standing and entrance term. 30 day assignment grades chart out all grades given in the past 30 days, culminating in her most recent grade. These charts are generated from the percentage grades; Sara's most recent grade is 67%. Last attendance shows the last date on which Sara was marked present for a class meeting time. Any and all disciplinary actions currently in effect on Sara are listed here, too. If you've added a registration lock to this student, you'll see it and the reason for it. Finally, you'll see any and all advisors assigned to this student. After filtering the report, you can also check off individual students for whom you wish to perform certain actions. Manage advisors: Academic Admins and Registrars can use this option to add or remove advisors for all the students shown in the report or only those who've been selected. See "Step 1" in this article for details. 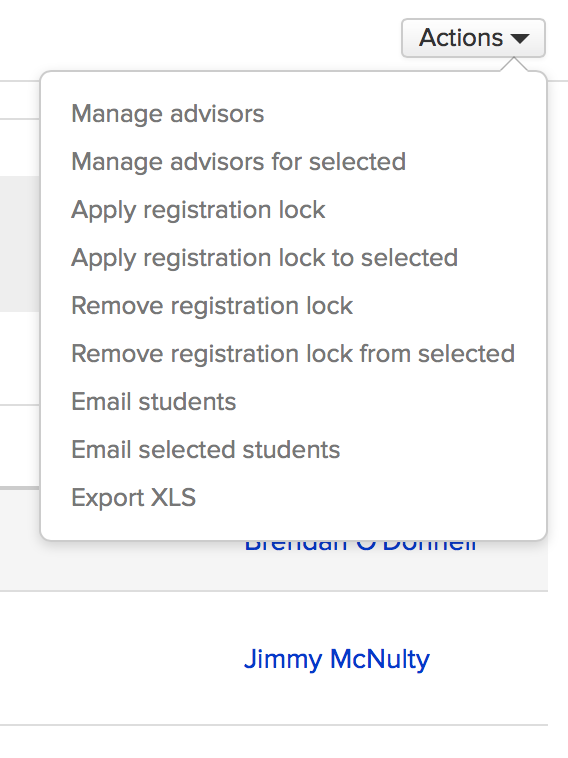 Add/remove registration lock: Registration locks prevent students from self-enrolling during online enrollment periods, requiring instead that their advisor or an academic admin/registrar register them instead. See this article for details. Email students: This lets you email all the students returned by your filter or only those you've selected. Export XLS: Likewise, this lets you export a spreadsheet of all the students returned by your filter or only those you've selected. The individual student advising view shows you her transcript, term progress report, and academic flags. 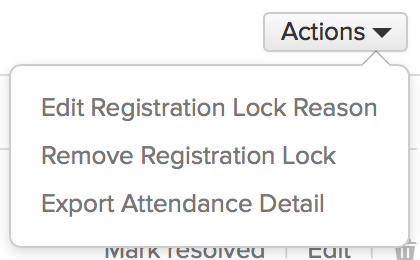 The actions menu has different options depending on whether the student has a registration lock. Apply/Remove Registration Lock: I think by now you'll know what these do. Edit Registration Lock Reason: Lets you change just the reason for the lock. 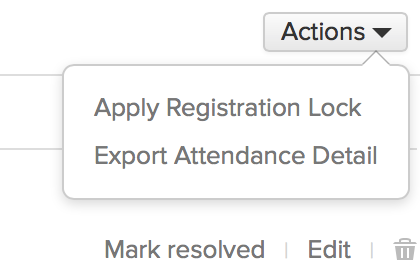 Export Attendance Detail: Creates a spreadsheet of the student's attendance records for the courses he's taking in the academic term you select. The course abbreviation links to the course catalog. The course name links to the student course summary, which gives you details about her grades and attendance for that course. Click the attendance percentage to see a chart of her own attendance compared with the standard deviation for other students' attendance in that course. Likewise, click the grade to see a chart of her assignment grades compared with the standard deviation for other students' grades in that course. Click to see her final course comment for a finalized course. 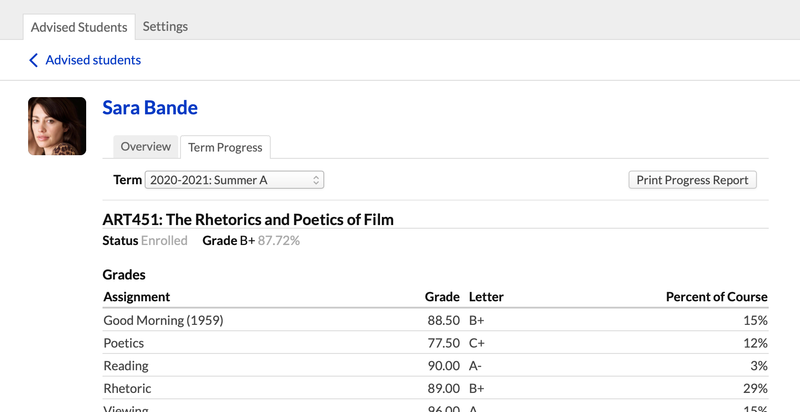 The term progress view gives you a list of all graded assignments and attendance records for each of the student's courses in a given term. Click Print... to create a PDF of the student's progress report. Flags may have been triggered by flag thresholds or were manually-added on the student course summary. This interface lets you see current and past flags. The selector is set to show all flags; you can also set this to see only active flags. The red flag was triggered by the flag thresholds established in Advising > Settings. Sara's performance in LIT201 is worrisome. 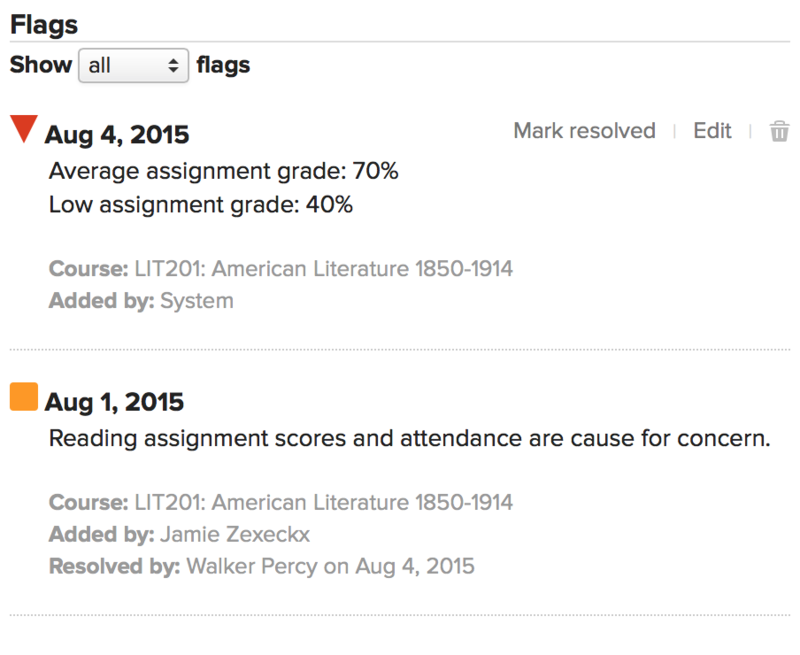 The yellow flag was added by LIT201's professor, Jamie Zexeckx, on Sara's student course summary. It was marked resolved by the great Southern Catholic novelist Walker Percy, and is considered a part of Sara's academic hertory. John's advisor, as well as any Academic Admin or Registrar, can click Mark resolved on any active red or yellow flag. Likewise, they can also edit any active flag. They can change the flag color and the reason given for the flag. If need be, they can click to delete an active flag altogether.